I suppose I shouldn’t complain – after all, it was our wooden, weekend morning feet that prevented Mack and I from getting to Chinatown on time to take in the Lunar New Year celebrations on Saturday. Still, for the most significant date on the Chinese calendar, and the most mainstream holiday with which to attract the public, it was more than a little disappointing that the only information I could find about the day’s activities was limited to a tiny box on the Chinatown/Little Italy Business Revitalization Zone website. From the looks of it, the event was the same as what they’ve organized in the past – remarks from various dignitaries, lion and dragon dances, and the lighting of firecrackers. It appears there was a modest crowd on hand for the hour-long festivities, but with more exposure and better advertising, I really think it could have been bigger. For one thing, there was no detailed program available online, just a single start time. It would have been helpful for prospective attendees to be aware of the schedule and the length of the program. At the end of the day however, I think the barebones event was a missed opportunity that failed to encourage Edmontonians to discover their Chinatown. I recognize it’s not easy, planning an outdoor program to take place in the middle of potentially uncooperative winter weather, without the cushion of a large indoor back-up option on 97 Street. 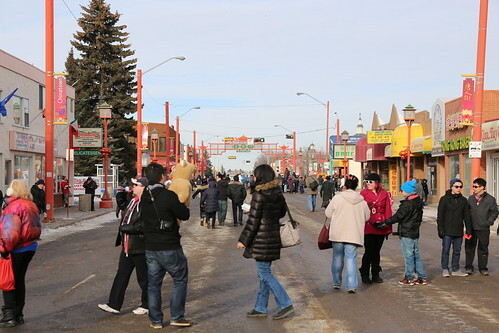 In addition, in the last decade, the family-friendly Lunar New Year carnival has moved away from Chinatown, from being staged in Heritage Chinatown at the Edmonton Chinese Multicultural Centre (drawing attention to the problem of “two Chinatowns”), to the Expo Centre, and now, at West Edmonton Mall. I’d also be remiss if I didn’t acknowledge the fact that Chinese residents (and other Asian immigrants) also live all across the city, and may have more convenient shopping and hospitality options elsewhere. Chinatown has become somewhat of a destination, instead of a routine, but if the occasion of Lunar New Year can’t entice people, what will? From what we caught of the tail end of festivities, bystanders were enthralled by the sights and sounds of firecrackers and colourful lions bucking around the pops and sparks. 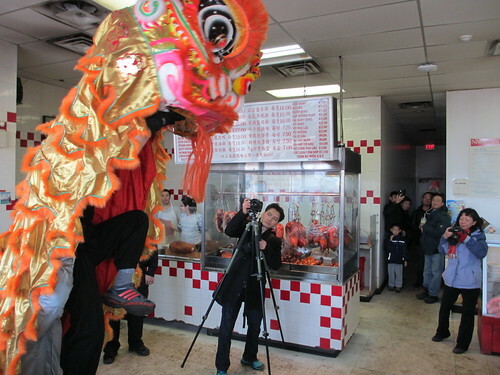 We also tailed one of the lion dance groups into a few storefronts, as they performed inside to bless the businesses for the coming year. The potential is definitely there, to feed the curiosity of those unfamiliar with Lunar New Year traditions and the cultures that celebrate them. It was evident through organizing the night market last year that people had a hunger for learning (our tour groups were oversubscribed! ), and the Chinese New Year dinner hosted by the Friends of the Royal Alberta Museum Society sold out in a matter of days. I’d expect the Business Revitalization Zone to lead the charge – after all, they are tasked with the job of increasing the economic activity of the area, and have the resources and connections to do so – but they seem to be resting on their laurels. Their events throughout the year amount to this seasonal foray, and the annual East Meets West festival. No historical tours, food tasting events, and nothing to highlight the influx of exciting new businesses (such as the rise of hot pot). I’m not sure what it will take for the shift to happen – I just hope it does, and the sooner the better.